Bonaparte Breads | Eat It, Damn It! Hot croissants. Fresh baked breads. MG and I were looking forward to getting something from a place that was billed as an authentic French bakery. A word to the wise. If you attempt to go there, the storefront is not visible from the main road. It is part of a complex called Savage Mills. Once you see some signs and a driveway, just pull in, park, and look for the sign that you see in the picture above. Hopefully, you will have a better experience than MG & I did. According to Yelp, their sign, and their website, they keep fairly normal hours. We arrived on a weekday, at around 11am. They were closed. There was no sign up that said “Back in 5”. There was no note about being closed for a few days. Wonderful smells were coming from inside, but the door was barred. 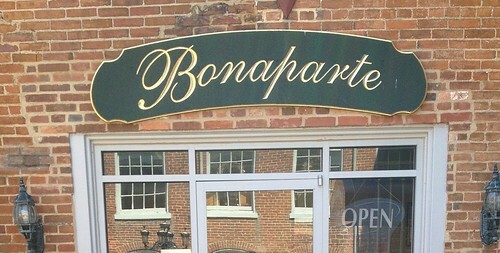 This isn’t so much a review of Bonaparte Breads as it is a tale of an experience. They might be good. I just don’t know. Maybe they had a family emergency and couldn’t open. Perhaps there was something extreme that prevented the manning of a counter. The baking section was certainly open. Take what you will from this experience. I just suggest calling before going to the store. If you make the trip without calling beforehand, ensure that you are not very hungry. There aren’t many other breakfast options nearby (as I found out the hard way).